I’m not personally falling a low-carb diet ( I probably should)! However, I made these for a friend of mine who is on the Keto diet right now. 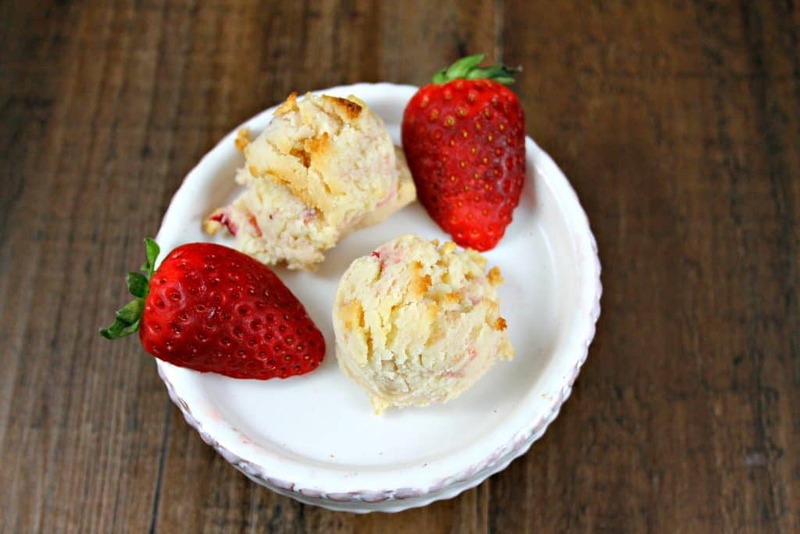 These low carb cookies are pretty amazing, even if you aren’t dieting. I mean there isn’t anything wrong with eating a bit healthier now and then. 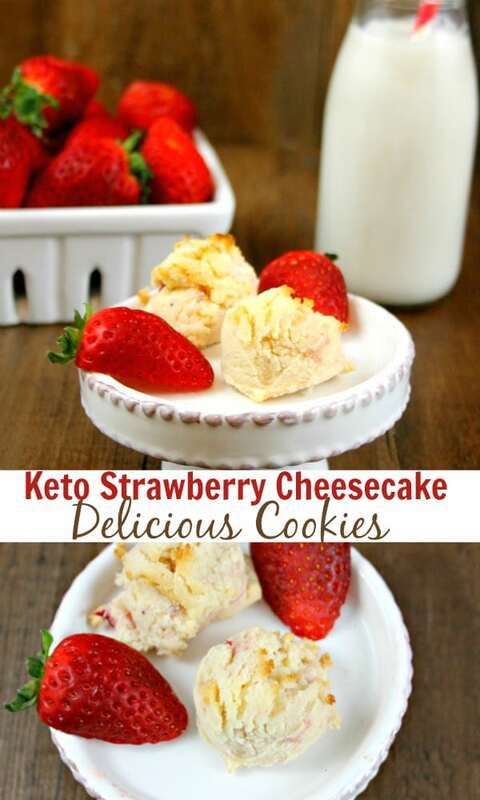 The best part is these Keto cookies are so dang easy to make! I whipped them up in no time at all. Not a strawberry fan? Not a problem, just switch out the fruit. You can use blueberries, cranberries, or anything else you want. 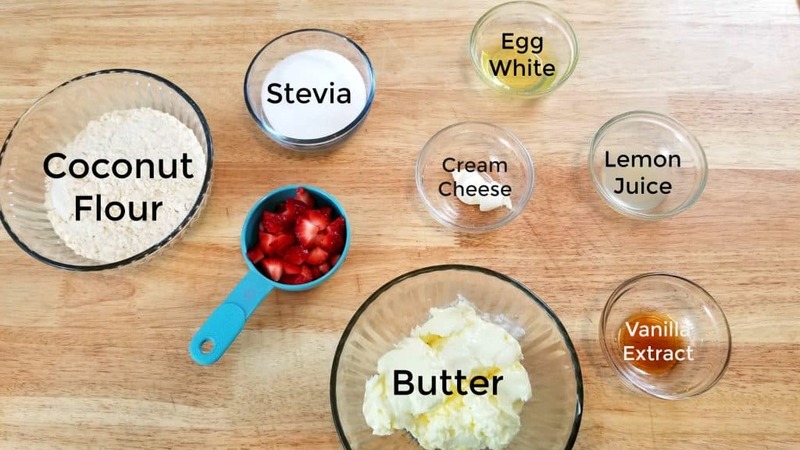 To make these yummy Keto cookies, you’ll need the following ingredients. I suggest doubling the dough and freezing the dough. You can even scoop out the cookies into balls, flash freeze them and then put them into a baggie. Doing this makes it easy to only bake a couple at a time. What’s a Keto friendly sugar substitute? I personally suggest Stevia but you can use any sugar substitute you’d like. You can use regular sugar if you’d like but then they wouldn’t be low carb cookies. Would banana’s work in this recipe? I haven’t tried it, so I’m going to say no. However, any kind of berries would be amazing! Avocado Brownies – Amazingly Yummy! Toss strawberries in lemon juice and drain after 1-2 minutes. Allow to dry. Once dry, toss in a few teaspoons of flour. Set aside. In a medium size mixing bowl, add the butter and sweetener. Cream together for about 1 minute. Add in the cream cheese, egg and vanilla and mix well. About 1 minute. Fold in flour until mixture forms a dough like consistency. Gently fold strawberries into mixture. Using an ice cream scoop, place balls of dough on cookie sheet. Bake for 9-11 minutes. Allow cookies to cool and store in an airtight container.